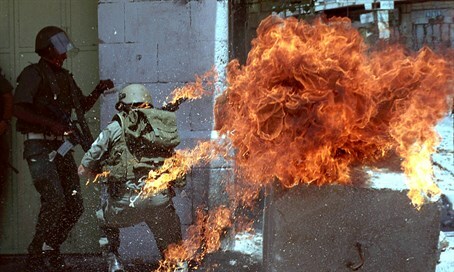 Terrorists set fire by base guard tower then attack firefighters, following Thursday firebomb on nearby Jerusalem base. Arab terrorists attacked an IDF base just east of Jerusalem late on Saturday night with firebombs, and then proceeded to attack firefighters who came to the scene to put out the blaze their Molotov cocktails had set off. The attack occurred at Anatot Base located just to the east of Mount Scopus and Mount of Olives - and took place just days after a near identical incident last Thursday at a nearby base inside the city limits. At Anatot Base, terrorists hurled firebombs at a guard tower on the base, setting off a brush fire but fortunately not wounding any soldiers. Two firefighter crews were dispatched to the scene, only to be met by the terrorists who hurled rocks at them and a firebomb that exploded close to them. IDF forces responded by using non-lethal riot dispersal measures, which generally include tear gas and stun grenades, and sometimes rubber bullets as well. The attack comes after Arab terrorists last Thursday threw a firebomb at the IDF's Ofrit Base in Jerusalem, located on Mount Scopus near Hadassah Hospital and Hebrew University's Mount Scopus campus - not far from Saturday night's attack. After the firebomb on Thursday set off a fire in a forested area near the base, firefighters were dispatched and eventually succeeded in putting out the blaze. The attacks come as part of a sharp uptick in Arab terrorist attacks focused on Jerusalem, which began last week on Sunday as the Jewish New Year holiday of Rosh Hashanah began. Aside from massive violent riots and attacks against police on the Temple Mount that lasted throughout the week, an Israeli was murdered in a rock attack in Jerusalem's southeastern Armon Hanatziv neighborhood on Sunday. Gaza terrorists also got in on the action, with terrorists there firing three rockets at Israel on Friday to which the IDF responded later Friday night with an airstrike on a Hamas base.